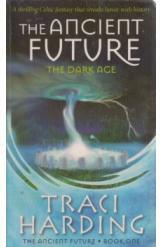 The Dark Age by Traci Harding, Sci Fi. Book is in good condition, all pages intact. When a car accident leaves Tory stranded near a circle of ancient standing stones, she decides to camp until morning. But ancient forces are watching through the standing stones, and she wakes up somewhere very different. Book one of "The Ancient Future" series.